Learning how to meditate is a fun, engaging process that will challenge you on many levels. These online meditation courses have been carefully crafted to help students overcome the most common obstacles that all will face when wishing to develop spiritually. A non-religious approach to learning greater stillness of mind and emotions. 60 videos, 15 readings, quizzes and guided meditations teaching the basics up to intermediate concepts. 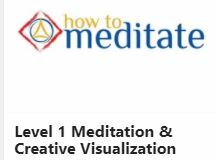 Course also includes complete teachings on using Creative Visualization. This online course is currently accessible by clicking this link. This course teaches a basic meditation style to use the mind as a visualization tool. Through visualization, the student utilizes the laws of attraction to draw into their lives those things they desire and value. Currently this course is only offered at Meditate Yoga and Meditation Center in Chicago.Click here to learn more.